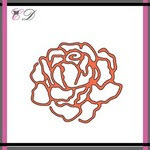 Gloria here today, I want to share with you a card using Rose die from Cheapo dies. For create this card, First I made big rectangle hole on the green card stock using a un branded Dotted rectangle die and decorate the edges with washi tape. I draw three roses along the rose die on the watercolor panel using pencil and colored with Peerless watercolor using water brush. I added some ink splatters all over the panel. And I adhere the watercolor panel using double - sided tape.